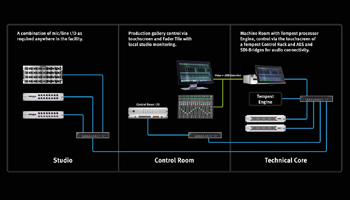 The Tempest Control Rack (TCR) offers an ideal solution for broadcast environments where a powerful broadcast audio mixer is required but a traditional console is not. 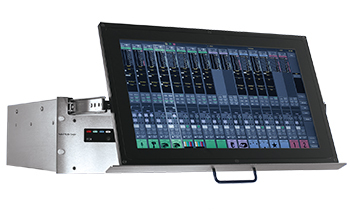 The Tempest Control Rack consists of a 3 RU PC enclosure with an optional retractable 15.6” touchscreen. TCR runs the complete System T control software so acts as a stand-alone control interface for a System T installation. The custom screen mounting system enables the screen to be used at a wide range of angles, allowing the unit to be mounted in a traditional 19” rack or in angled studio furniture. 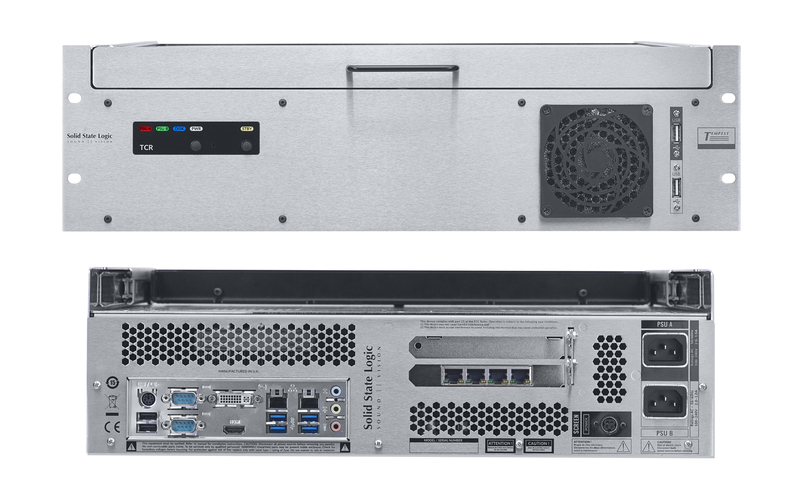 TCR features dual PSU, Primary and Secondary OCP Network Connections, Primary and Secondary Dante Networks connections, Studio Integration Network connections (for Production Automation systems) and SSL Network connectivity for other System T control interfaces or T-SOLSA control from any PC on the network. There are HDMI and DVI-D video outputs, plus front and rear panel USB connections for Keyboard, Mouse and USB storage devices. 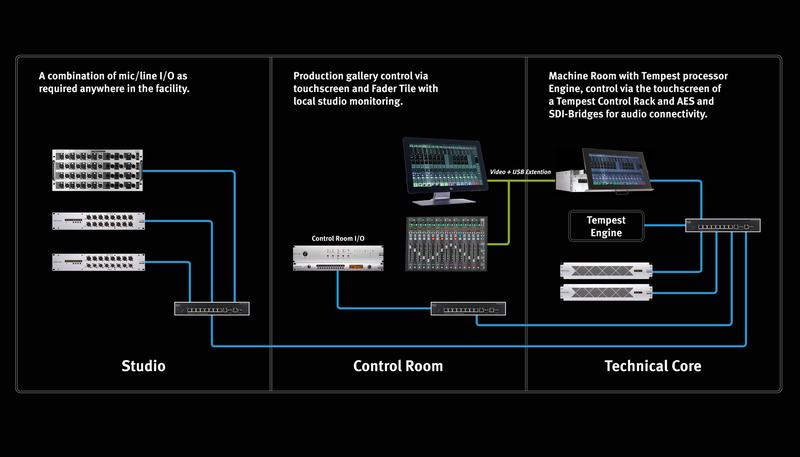 When combined with a T25 (or T80) Engine, the Tempest Control Rack creates a standalone System T mixer in a rack. This combination is ideal for Production Automation controlled studios or can be combined with SSL Stageboxes to create a ‘Flypack’ for remote production. 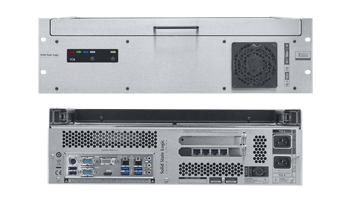 The combination of the Tempest Control Rack (TCR), a System T processor Engine and SSL Network I/O delivers a system that is ideally suited to Production Automation driven facilities. 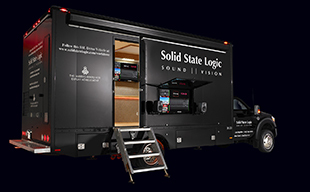 System T is compatible with Ross, Grass Valley, Sony and Mosart Production Automation. In the example system shown here we have the main System T Engine located in a Machine Room accompanied by a Tempest Control Rack that provides a touchscreen interface for the console software. 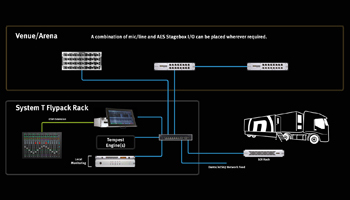 Network I/O AES-Bridge and SDI-Bridge units in the Machine Room provide audio interconnection as required. In the Production Gallery console software control is provided via an optional Touchscreen and Fader Tile which are connected via Video and USB extension to the Tempest Control Rack. There is Control Room I/O for monitoring. SSL Network I/O units can be placed on the studio floor or anywhere in the facility to provide Mic/Line and AES I/O wherever required. The combination of an SSL System T Tempest Control Rack (TCR) and Tempest Engine creates a broadcast audio production system with all of the features and power of a traditional broadcast console in just 7RU. The System T ‘Flypack’ is an ideal solution to the challenges of remote broadcast audio production for sports and large scale events. The Flypack contains a combination of the Tempest Control Rack, a System T processor Engine and SSL Network I/O delivers a system that is extremely versatile and ideally suited to deployment as a completely portable flight cased solution. Remote production can take many forms, discrete audio channels back to the Broadcast facility, a skeleton crew mixing parts of the show from temporary onsite locations or remotely controlled processing and IO configured and controlled via backhaul links to a broadcast centre. System T’s modular design and use of standard networking technology allows all of these options. Connectivity can provide control of TCR from other consoles or PC software. 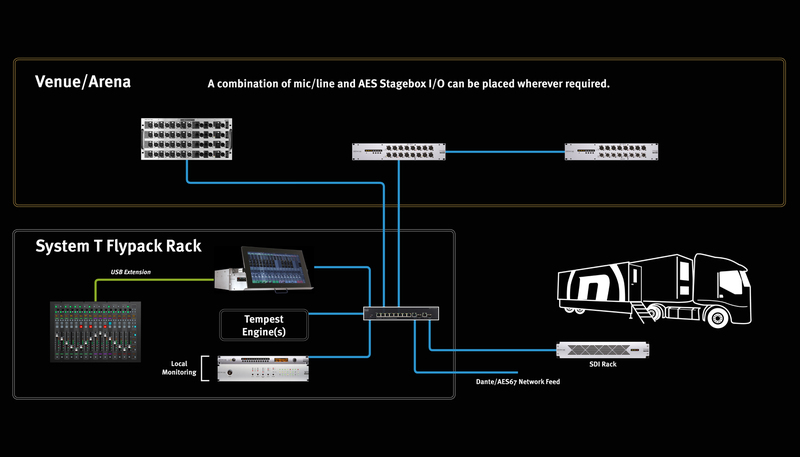 Discrete audio or premixed feeds can be supplied to video backhaul or codecs via AES67, Dante or any Audio format using SSL’s Network IO range.